Videos and footages made with a drone nearly always need background music due to the noise produced by propellers, and the music you select could make or break a video. Under the fair use policy, most footages used for purely non-profit purposes are able to use any music, copyrighted or not copyrighted, provided that they give credit to the song artist in the description of the video. This policy also states that Borrowing small pieces of material from an original work is more prone to be considered fair use than borrowing large portions. An example of following YouTubes fair use policy can be found here, where I used about 50% of a copyrighted song to cover the duration of my drone footage, and gave credit to the artist in the videos description. This obviously will only work when uploading drone footages to YouTube, but I extremely recommend you do so if you want to use copyrighted material in your videos. 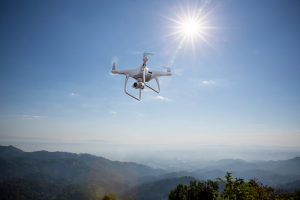 Using drone videos and copyrighted material for profit is a different story. Without being granted explicit authorization from a songs artist, it’s illegal to use a copyrighted song for monetary or other personal gain. There are, however, two kinds of music that ARE legal for you to use: Royalty free and Public Domain music. Public domain music is probably the safest bet for you to use, although frequently not ideal because of its nature. This music consists of any piece made prior to 1922. A list can be found here at the Public Domain Information Project. Royalty free music is only somewhat different. This music can be from any year, and is simply made by an artist who wishes to permit their works to be used freely without their explicit prior consent. An excellent custom searchable list of royalty free music is maintained by Kevin MacLeod at Incompetech.com. This may never be a complete list, as new songs are being made every day, but it’s something I’ve been able to use to great effect. Given that the different legal uses of music have been covered, there only remains to actually choose a song for the background of a drone footage. This is possibly the most crucial part of video editing because, as mentioned before, utilizing the wrong or right song could make or break a video. Utilizing a song inappropriate for the situation results in the footage being disagreeable to watch, so it’s important you pick the right song. The video embedded above is a slow drift across to show the progress being made on a renovation. As such, selecting a fast paced or full of energy piece or restructuring were inappropriate, and I adjusted the song accordingly. The fact that I filmed this in full sunlight also directed the final song toward a happy, but ambient piece. When it boils down to it, selecting the final track is mostly common sense.